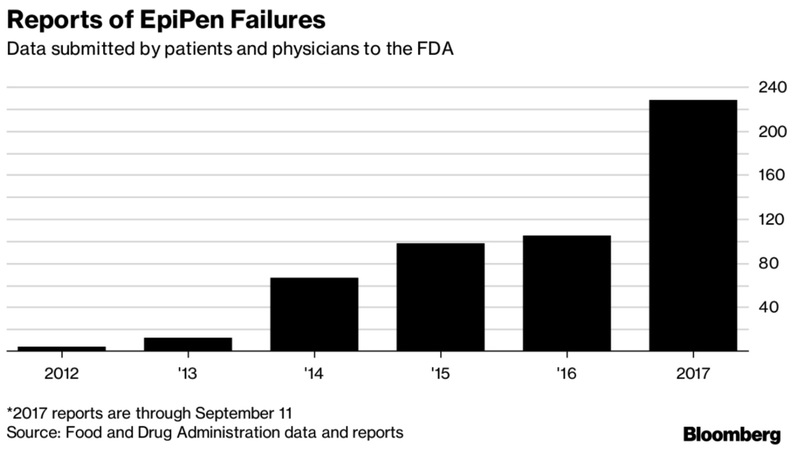 [From www.bloomberg.com] Failure of EpiPens to deploy correctly have been cited in seven deaths this year through mid-September, according to reports by patients and physicians made to the U.S. Food and Drug Administration and obtained by Bloomberg News. The FDA received a total of 228 reports of EpiPen or EpiPen Jr. failures during the same time period, according to documents made available as a result of a Freedom of Information Act request. In addition to the deaths, 35 people were hospitalized, according to the reports. EpiPen and EpiPen Jr. failures… resulted in a recall of some units in March by the company that makes the device for Mylan, Pfizer Inc.’s Meridian Medical Technologies. Mylan, which sells the drug-device combo using Meridian’s “pens,” called the defect “extremely rare” (read A Pfizer Company that Makes EpiPen Devices Failed to Investigate Patient Deaths Says FDA). Mylan, EpiPen Price Gouger, Ranks No. 2 in U.S. #Pharma Exec Pay! There are increasing volumes of evidence that demonstrate that when you focus on the impact you make to patients, your commercial performance will improve. And, as our healthcare stakeholders adapt to the same economic conditions, driven by data and the ability to measure outcomes, it improves even further. But the question we often get asked is “how”? 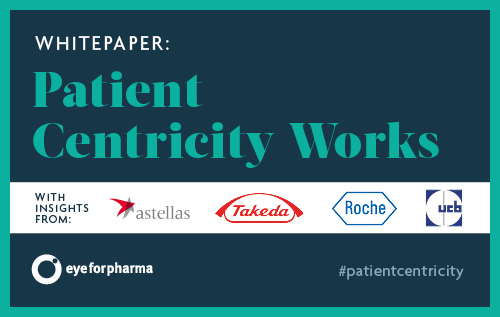 Which is why eyeforpharma have built this white paper collaboratively with pharma leaders from around the world, sourcing insights from different companies and different departments on how patient-centricity can be brought to commercial teams. Sponsored by FC Business Intelligence Ltd.
[From www.fiercepharma.com] When Allergan CEO Brent Saunders announced Wednesday that cost cuts would come “rapidly,” he didn’t offer any insight as to where in the business those cuts would be. But commercial chief Bill Meury did. One way the company might do it? Cutting back on DTC spending. Thanks to Facebook’s testimony before Congress, we know that $900 can buy 300,000 views. That’s $3 per thousand views. 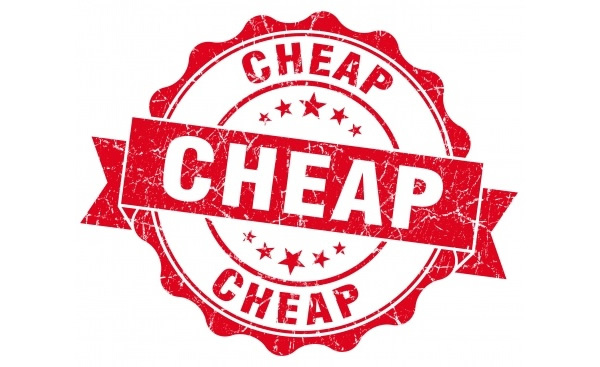 TV ads can cost between $10 and $23 per thousand views. That’s one question on the mind of EyeOnFDA author Mark Senak of FleishmanHillard’s Washington, D.C. office. 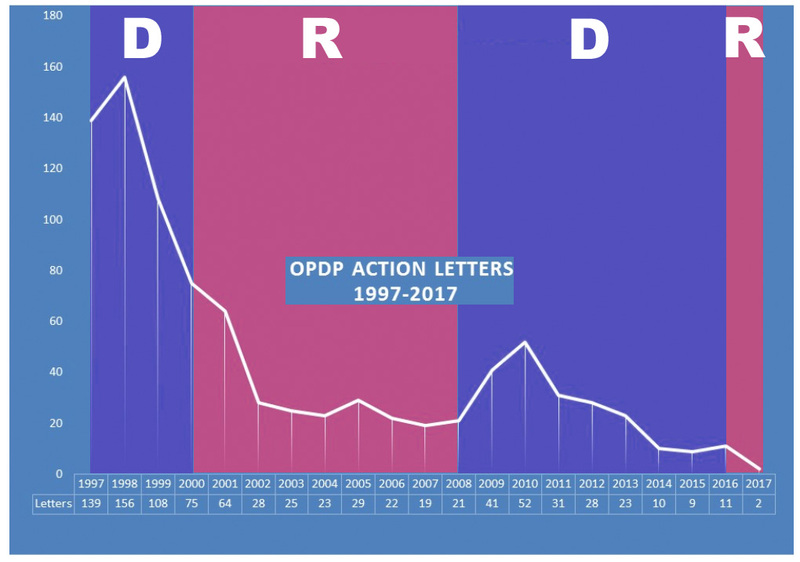 Senak plotted the number of “Action Letters,” which are Warning Letters to drug company CEOs plus so-called “untitled” letters addressed to underlings – usually regulatory officers. I copies his chart and highlighted the years in which a Democrat (D; blue) or Republican (R; red) was in the White House. The FDA’s Chief Counsel between August 2001, and November, 2004 was Bush-appointed Daniel E. Troy. Soon after being appointed, Troy instituted a legal review of regulatory letters before they were issued and this policy change effectively hobbled the issuance of these letters by the FDA. Troy’s delaying legacy continued after he resigned. (see FDA DTC Review: The House that Troy Built). As you can see, the number of letters issued by the FDA rebounded sharply in 2009 and 2010 when Obama was president. It was as if the floodgates opened. After that, the number of letters slowly declined. Unless the FDA issues a bunch of new letters in the final 2 months of 2017, the total count will be at an historic low. Obviously, this is in tune with the current administration’s focus on de-regulation. Now we have Trump-appointed Dr. Scott Gottlieb as head of the FDA. What will his impact be on FDA enforcement activities? Previous articleWhy Has There Been a Drop in FDA Enforcement Activity? Next articlePinUp: The Masters to Whom Pharma CEOs Are Beholden!